Last November human rights activist, film-maker, poet and academic Saba Vasefi launched her films, Symphony of Strange Waters and Don’t Bury My Heart, at Parliament House in Sydney to an appreciative and supportive audience. The event was organised by Greens Senator Lee Rhianon and Greens Member of the NSW Legislative Council, Dr. Mehreen Faruqi. The audience were treated to speeches by author, academic and editor Michelle Cahill; Head Of Producing at the Australian Film Television and Radio School (AFTRS) Andrena Finlay; and musical performances by the Tara Anglican School’s Axis Wind Ensemble (conducted by Iain Hoy), and Minerva Khodabande, cellist with the Sydney Youth Orchestra. First screened at The United Nations in Geneva, Symphony of Strange Waters is a poetic and metaphoric film which deals with the experience of an Iranian child refugee arriving in Australia, a country where “even the taste of the water was unfamiliar to me”, and where her inability to speak English left her feeling isolated and unheard. 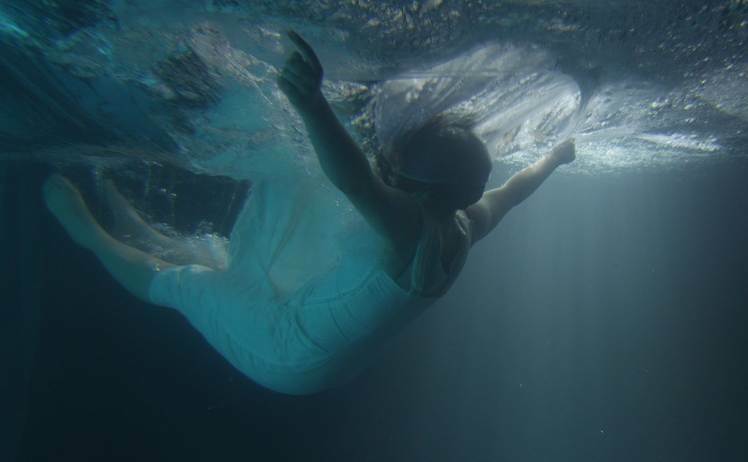 The film is visually breathtaking, with the first half sub-titled and shot underwater, allowing the audience to experience the sense of exile and voicelessness of the young refugee before she discovers— on taking her cello to school one day—that when she plays “People stopped, and started to listen”. Able to speak for the first time through the medium of her music, she then emerges onto dry land, having found a way to connect with her new home and its people. The film expresses how vulnerable and “at sea” refugees feel in a strange new land, and how important artistic pursuits are in helping them to find their voice and express and process their traumatic experiences. As poet Michele Cahill pointed out, while our own government’s policies on refugees become increasingly regressive and ideologically reductive, the use of art and music therapy becomes even more essential, functioning—in essence—as a form of breathing, a method for survival. 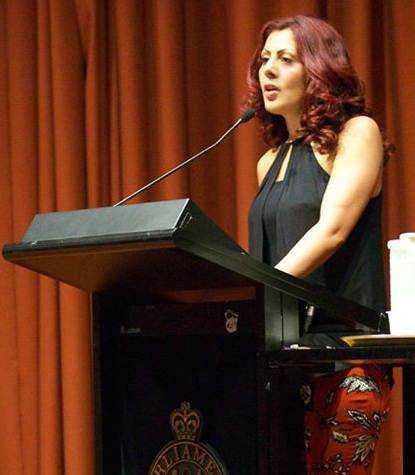 Saba Vasefi – speaking at the screening of her films Symphony of Strange Waters and Don’t Bury My Heart at NSW Parliament House. 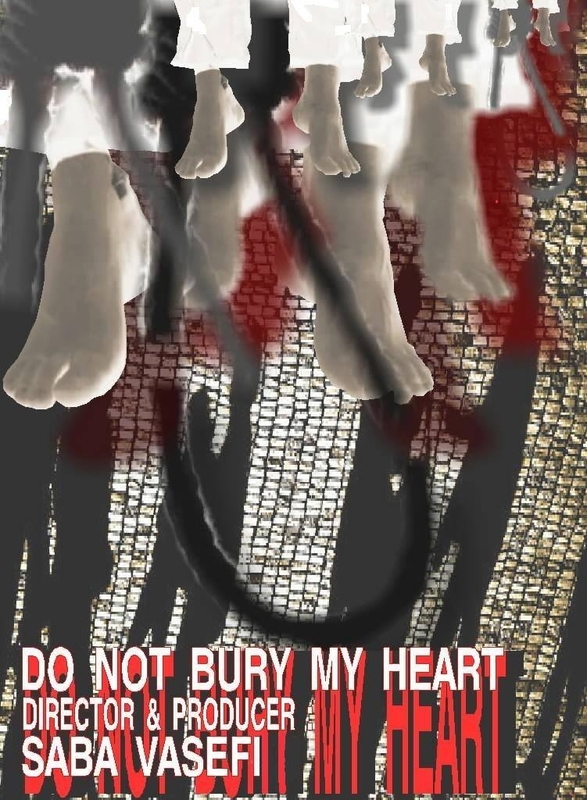 Don’t Bury My Heart—which has previously been screened by Amnesty International, the United Nations, the BBC, UCLA, and at the Copenhagen International Film festival and the Seen & Heard Film Festival—is a documentary dealing with the chilling issue of the death penalty in Iran as it pertains to children. Although it is illegal in Iran to put children who have committed a crime to death, they may, and are being, sentenced to death (from the age of 9 for girls and 15 for boys), and then held on death row until the age of eighteen, when they are executed. These horrific set of circumstances are explored in a compassionate and complex way in Don’t Bury My Heart: the victim’s—as well as the perpetrator’s—families are interviewed, and many of the scenes in the film are extremely emotional and harrowing. In fact, there was a stunned silence at the end of the screening, as the audience struggled to digest the shocking reality of what they had just witnessed. In making Don’t Bury My Heart, filmmaker Andrena Finlay said that Saba was to be commended for using film as a tool to shine light on important human rights issues, literally bringing them out of the darkness of the Iranian government’s censorship. To highlight this she told the story of how some of Saba’s film footage was confiscated by officials, and how the documentary was only completed because Saba had the foresight to leave a copy of the film on a USB stick with her mother, who buried it in her garden and then emailed the footage piece by piece back to her in Australia. That the film was made at all is testament to the indomitable spirit of the film maker, and her determination to speak out on behalf of those whose voices are ignored, particularly those of children. As Mary-Ellen Mullane (Investment/Development Manager in Documentary at Screen Australia) commented after seeing the films, “Symphony of Strange Waters and Don’t Bury My Heart are both very much works ‘from the heart’ of a strong woman with something to say. She (Saba) shows great potential as a film maker.” All who were in attendance on the evening, and who have viewed the films world-wide, could not help but agree. This entry was posted in Don’t Bury My Heart, Issue 13, Michele Seminara, Saba Vasefi, Symphony of Strange Waters and tagged Andrena Finlay, Iain Hoy, Iranian refugees, Michelle Cahill, Minerva Khodabande, Parliament House by Mark Roberts. Bookmark the permalink. Last year I had the honour of attending a film screening by friend, human rights activist and documentary filmmaker Saba Vasefi. Here’s a review I wrote of the evening, and the films – which deal with the important issues of the refugee experience, and the death penalty as it applies to children in Iran.